With Easter right around the corner, I wanted to make something special with the tot to celebrate. When I think of Easter memories of candy, cookies, candy, a few Easter egg hunts, candy, and more cookies come to mind. Vanilla, lemon, sugar, whipped cream, and chocolate top my list of Easter goodie must-haves. We had some lovely fresh lemons, which were perfect for tossing together these wonderfully tangy cookies. And we topped them in a really special way – by hand-painting them with vanilla frosting. 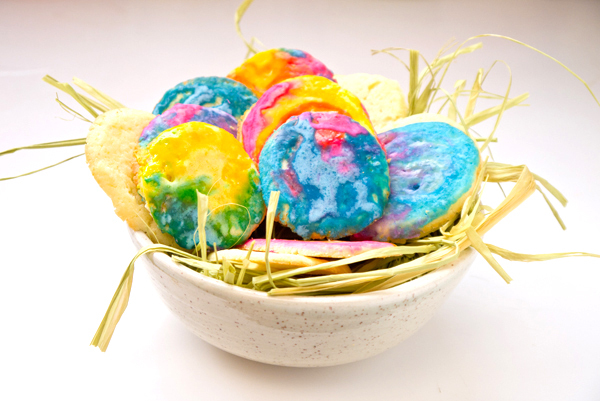 This is just about the easiest cookie recipe to put together and inviting the kiddies to slather tangy egg-shaped cookies with edible paint is a perfect way to spend Easter together. Not up for the baking part? Simply pick up a roll of store-bought refrigerated cookie dough and you’re good to go. Simply toss all the ingredients (sans the flour) for the cookies in a medium-sized mixing bowl and give things a whir with a hand mixer. Once things have come together, slowly add the flour until it’s all incorporated. Tear off a length of plastic wrap and smooth out flat. Spoon the tangy cookie batter onto the plastic wrap in a line. Now roll up the plastic wrap while rolling the dough, (just like you’re making a play-dough snake) and twist the ends, creating a happy log o-cookie dough, just like you pick up at the store. Place the wrapped cookie dough on a plate and place in the fridge for at least 2-hours. Or, pop in the freezer for an hour. Preheat your oven to 350 F and lightly grease a sheet pan – or cover with a silpat or parchment paper. Unwrap your cookies and slice on a slight bias (or diagonal) about 1/4 inch thick, and place on the sheet pan allowing about 1-inch space between cookies. Pop in the hot oven for 10-12 minutes or until the edges start to brown. Remove from the pan and let cool before painting. 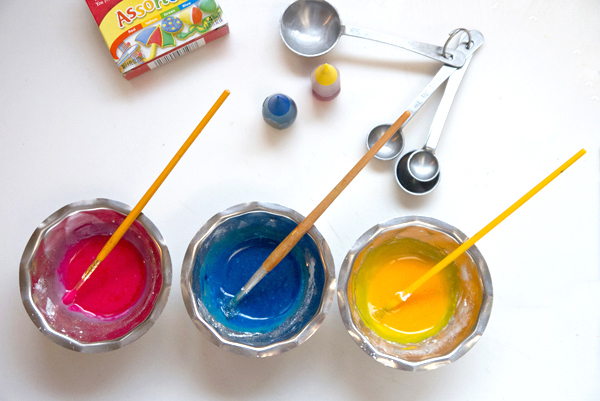 While the cookies chill, make the edible paints. It’s as easy as mixing together the powdered sugar, vanilla, food coloring, and water for each cool you’d like to make. The finished paint should be the consistency of tempera paint. We kept things simple and made red, yellow, and blue paint. And, so things were really nice and clean, I ran our paintbrushes through the dishwasher before painting. 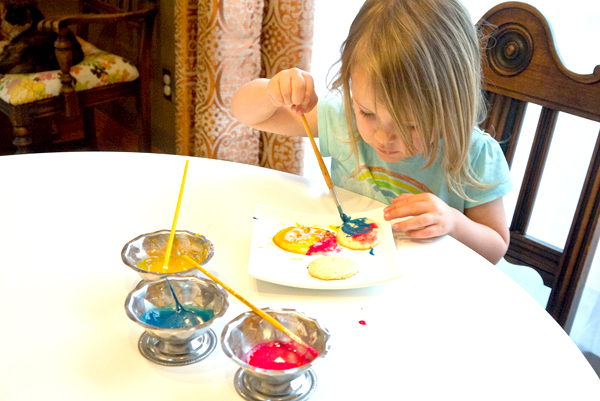 Once the cookies are cool, invite your child to use the edible paints to decorate the lemony Easter egg cookies. Let the frosting set and then enjoy! We piled ours up in a bowl full of green raffia alongside some plain unpainted cookies for a sunny centerpiece.